Bluestem Environmental Education brings you authentic handmade replica games bringing living history to life in hand crafted games. No two games are alike and are hand crafted based on historical research teaching about Native American/American Indian lifeways and early games of settlement. These games are suitable for use in living history events, as a compliment to an American Indian or First Nation unit of study. Because of their historic nature and simple utilitarian beauty, these games could be used as decoration for your home office or school. All games are to be used with direct adult supervision and due caution. 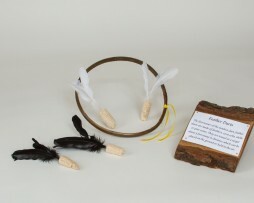 Featured games are; lacrosse, double ball, spear hunting game and feather darts. One set of four games can engage 10 children at a time. Many schools purchase two sets to engage 20 children at a time. These materials may qualify for purchase with Alaska Title V funds. Remember if shipping to anywhere but the lower 48 US states, please contact us first for a shipping quote. Also due to the large popularity of these games and that they are hand crafted, shipping could be 4-8 weeks particularly if it is a large order. All of our materials are hand crafted, hand made. Good things take time! Please be mindful of that when ordering. The aim of this game was to practice skills for hunting small game. Today this game can be used for developing eye-hand coordination. This game requires adult supervision. A person rolls the target hoop on the ground only. Another person kneels on one knee about 6 feet from the hoop and throws the spear through the inner target. The spear should never be tossed at or near a person. 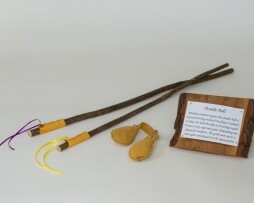 The Spear Hunting Game kit comes with two handcrafted target hoops measuring 15 inches and 20 inches in diameter strung with sinew and decorated with ribbon, two spears with sinew balance point grips, a ribbon tail and a sign on a rustic hard wood slab with Spear Hunting Game information. This kit is for two or four players. 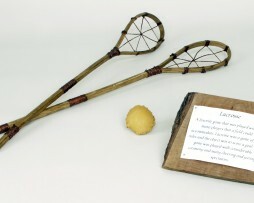 Lacrosse is a favorite game of many Native American tribes each having their own style of Lacrosse stick. The game was played with as many players as a field could accommodate. Lacrosse was a game of few rules and the object was to score a goal. The game was played with considerable fanfare. The Lacrosse Game kit comes with two handcrafted lacrosse sticks with braided sinew 34 inches long, a lacrosse ball and a sign on a rustic hardwood slab with Lacrosse game information. This kit is for two players.